Good morning lovelies, this morning I'm going to show you what I spent 2 hours doing last night: reorganizing my stash. I've been debating getting an Ikea Helmer or a 2 Michael's "Melmers" aka JetMax storage cubes. So I went to Michael's. No 3-drawer storage cubes. None currently ordered for the store. Unknown if more will ever come in. So that totally burst my bubble. I needed to do something - my stash was overflowing. That is what you call overflowing. Notice one of the drawers is not even in the tower because it was too full. Plus all the stuff on the shelf. And the separate cases for China Glaze and OPI. Plus stuff on the floor. I had the second tower in my closet holding various things. A lot of things you don't want to throw out but don't really use/look at... I'm sure you know what I mean. It also held my sunglasses. Now everything has a home. Top - mostly drug store brands. Middle - nail wheels, tools, brushes, cuticle oil, etc. Bottom - packaging and cosmetic bags and just stuff I don't want to throw out but are not really useful. Third - my OPI case is in here (I left them in the seperate case just so they don't bang around,) along with a case full of rhinestones/etc, my box of Qtips and the large bottles of acetone and remover. Bottom - Color Club, Orly, Sinful Colors, Milani, and a few other things. My nail art pens still sit on top in a separate case and I like to keep my small bottles of remover/acetone and my base/top coats and treatment there, too. I don't particularly like the way it is now, but it is better than before. It'll stay this way until Michael's restocks their cubes or I go to Toronto. Hahaha. I think I have sunglasses hoarder disorder on top of polish hoarder disorder. I look forward to the day I get better storage and will be able to return these plastic units to their original uses - yarn, crafts, sunglasses, and random sentimental items. Whenever I get my new storage I'll work on new collection photos, because I know how much everyone likes those! I would do it now if I didn't have at least 32 polishes on the way to me from swaps and the giveaway I won... Heh. Swaafie is holding a nail art contest, and everyone can vote for their top three favorites! Then the top six will be judged by a panel she chooses. Check it out here. I'll do a post on my mani in the future - I really liked it! I am struggling like this as well without a Helmer/Melmer... I finally think I am going to cave and get one.. I bought a 3 shelf book shelf from Wal-Mart for only $24. It works fabulous. 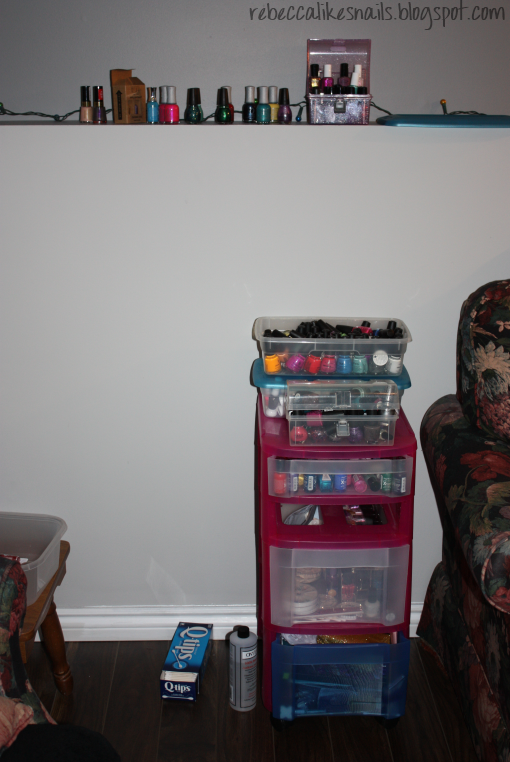 It's about 3 feet wide, slightly under a foot deep and 3 1/2 feet tall and it holds all 273 polishes I own, plus some. I just got 2 Melmer's so worth it! I got them both 40% off with the coupon from Hobby Lobbys website (good until the 11th btw) so they were both $19 each! Whoever told you they weren't on order etc was lying to you. We constantly get melmers in. It's one of the most popular jet max storage things we get in. In fact we just got a huge shipment in from another store for a bunch of jet max stuff. And the truck last night also had a huge order of jet max. ^ it was a manager! !